For those without comedic tastes, the so-called experts at Wikipedia have an article very remotely related to All Your Base Are Belong To Us. There is an alternate version of this article at All Your Base Are Belong To Us. 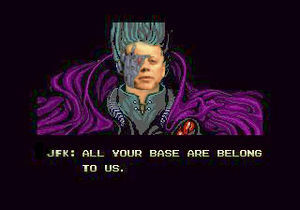 Subtitled footage of Kennedy's All Your Base speech is available in the National Archives. When now retired US president John F. Kennedy made his famous speech in Berlin in 1963, it was this phrase that galvanised his audience. Legal disputes over just this issue had already led to the Cuban Missile Crisis where a minor disagreement about import duty on thermo-nuclear warheads led to a major falling out between the United States and Cuba. The Bay of Pigs fiasco followed, and America ended up with Guantanamo Bay. Kennedy, however, realized that this meant that many parts of Germany could technically still be considered part of America. This remains the case today. The unusual syntax of the famous phrase is officially attributed to a typo by the Japanese speechwriter Cats San. There is, however, widespread speculation that the phrase was President Kennedy's only truly improvised remark in his entire career (possibly the only such instance in modern U.S. history), and the abnormal phrasing was due to an incredibly well-concealed complete lack of grammatical skills. Reginald Humber of the Houston Humbers once upon presenting arms to a foreign diplomat uttered this phrase and was promptly socked in the mouth. Here, Kennedy is referring to the start of the Cold War. What started the war, he ponders. Jemand stellte uns die Bombe auf. His answer? The invention of the atomic bomb. Kennedy now taking the audience back to his historic last-minute diplomacy with then Russian Premier George Harrison. Kennedy’s famous opening words to the Soviet Premier. Wie Sie Herren! sind !! How are you gentlemen !! Harrison’s pitiful attempt to evade the key issues is summed up here. Ihre ganze Unterseite sind gehören uns. The heart of the speech, and the nub of the peace talks. Kennedy jumps straight in and announces the seizure of the Cuban bases to the as yet unknowing Soviets. Sie sind auf der Weise zur Zerstörung. Harrison’s reaction is a typical knee-jerk display of Soviet bravado. Kennedy pretends not to have understood: an interesting gambit. Sie haben keine Wahrscheinlichkeit zu überleben bilden Ihre Zeit. Harrison now clearly overcompensating for his weak tactical position. It's plain to see that Kennedy’s got him on the ropes. See how Kennedy makes light of Harrison’s idle threats. It was to be the finishing blow. Entfernen Sie jedes ' Zig ' !! Sie wissen, was Sie tuend. Verschieben Sie ' Zig '. You know what you doing. Ending on a triumphant note, Kennedy puts past victories behind him and returns to the present. “Take off every Zig.” He implores the assembled Berliners, “For Great Justice”. He retires to a standing ovation. All Your Base Are Belong To Us/Example on wheels!